Every now and again, a book comes along and you think “WOW! I wish I’d read this before!”. This is one of those books. 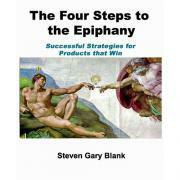 “The Four Steps to the Epiphany” by Steve Gary Blank. While I’ve read a lot of books about start-ups and entrepreneurship, all of them tell you pretty much the same thing, but nothing specific enough to act upon. This book is a roadmap for anyone launching a product based company, but particularly for online-services such as ours. It fits in so nicely with what we learnt from our trip to the US, what successful companies must do and why so many start-ups fail. For starters, it focuses on the customer development model. The traditional way a lot of companies start is this: build a product, launch it, get a sales team to sell it, and hopefully you’ll get some customers and become successful. In fact in all honesty, it was the way we were going about things (even though we knew better!) until we got a reminder from all the guys in the US to sell it then build it! I think on our side, it was much easier with our technical backgrounds to just build what we thought would be useful, based on our experiences with working for large clients in Accenture, than actually go around talking to lots of potential customers, and I think it took us seeing it to believe it (as we did in the US) that you could actually sell something to someone before it actually existed. But I know we’re not the only ones to do this, in fact loads of start-ups do it, and thats why they fail. This book essentially states the obvious – why would you build anything until you know you have a market for it? Lots of books talk about market research, business plans and the such, but none of them give you a clear process of how to reach potential customers, validate your idea and assumptions, build your sales material and positioning while you’re talking to your market, and effectively modifying your product (if needed) as you go along, so that by the time you launch, you have a product people want AND some initial customers. I think if we’d read this book at the beginning we could have shaved 6 months off our sales cycle while we try to find our initial customers. What hit me is it pretty much validated everything everyone in the US was telling us, to the point I was thinking “they must have read this book too!”. So if you’re about to launch a start-up around any product, you HAVE to read this book. Unfortunately its only available in the US right now, so you’ll have to buy it and ship it from Amazon.com in the US, it took a couple of weeks and cost around £33, but is well worth the wait and money! From now on this book has become our bible and roadmap to launching SambaStream!